When database system administrator installs Microsoft SQL Server 2005 and creates a few database engine instances, there will be problem and hard time to remove and uninstall these multiple database instance components and the corresponding SQL Server services. When users try to uninstall Microsoft SQL Server 2005 or remove database instance components using Add and Remove Programs or Uninstall or change a programs (Vista) in Control Panel, only one SQL Server 2005 database engine can be selected. After uninstallation has completed, when users attempt to run the SQL Server 2K5 Uninstall to completely clean remove any other instances or components, the action will fail with error message saying the uninstaller shortcut entry is invalid and asked if you want to remove the link. When you run Add and Remove Programs or Programs and Features (for Windows Vista, Windows 7 or later) in Control Panel, it actually executes the ARPWrapper.exe program that is installed by Microsoft SQL Server Setup Support Files component by using the /Remove option. However, when ARPWrapper.exe completes its removal task, the program also uninstall Microsoft SQL Server Setup Support Files component and hence removes itself or deletes the reference to the ARPWrapper.exe program. This is the cause that prevents administrators to run the uninstaller again to remove database instances or uninstall SQL Server 2005. The resolution to remove multiple database engine instances from Microsoft SQL Server 2005 is to install ARPWrapper.exe again after removing each components. The following guide provides step-by-step instructions on how to uninstall stand-alone or multiple instance of SQL Server 2005 manually. Login to the server with an administrator user account, or SQL Server 2005 service account. Stop all active SQL Server services in Services applet in Control Panel as any active connections may prevent the uninstallation process from finishing successfully. Go to Control Panel and then Add or Remove Programs applet. Search and verify that Microsoft SQL Server Setup Support Files appears in the list of installed programs. If it’s found, proceed to next step. If Microsoft SQL Server Setup Support Files component is not listed as one of the installed program, install the component by running sqlsupport.msi file locates in Servers\setup\ folder of the original SQL Server 2005 installation media, or disc, folder and USB flash drive that contains SQL Server 2005 setup files. 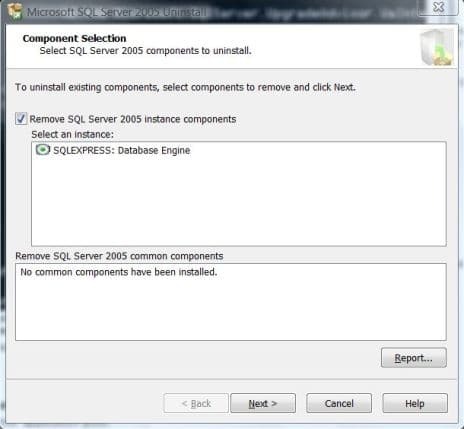 Uninstall the SQL Server instance components such as database engine one at a time. Once the removal completes, repeat all of the above steps again until all the SQL Server components are uninstalled. Finally, uninstall the Microsoft SQL Server Setup Support Files component by using Add or Remove Programs (It should has been removed, but double check to ensure that). Above guide assumes that you didn’t encounter any other problems, and simply want to get rid of all DB instances of the SQL Server 2005. If you have other issues, refer to KB909906 on how to manually uninstall SQL Server.